A freak accident in rural Wyoming leads the Sheriff’s Department to arrest a man for a possible double homicide, but further investigations suggest a much more horrifying discovery – a serial killer who has been kidnapping, torturing and mutilating victims all over the United States for at least twenty-five years. The suspect claims he is a pawn in a huge labyrinth of lies and deception – can he be believed? The case is immediately handed over to the FBI, but this time they’re forced to ask for outside help. Ex-criminal behaviour psychologist and lead Detective with the Ultra Violent Crime Unit of the LAPD, Robert Hunter, is asked to run a series of interviews with the apprehended man. These interviews begin to reveal terrifying secrets that no one could’ve foreseen, including the real identity of a killer so elusive that no one, not even the FBI, had any idea he existed … until now. It was a truly evil book and it is not a compliment. First of all, almost all character descriptions were done extremely clumsily. They more or less qualified as infodumps. Secondly, I got a feeling the plot borrowed too heavily from stories about Hannibal Lecter, especially ‘Silence of the Lambs’, and a old Brad Pitt thriller ‘Seven’. Thirdly I had an impression every single chapter ended with a kind of cliffhanger. Which was annoying because I hate that narrative device and kind of silly too because most of these ugly cliffies didn’t work as they should have. Fourthly, I found the characters to be mere cutouts and the main baddie, an evil genius of serial killing, was not scary in the slightest. I grant it, the horror parts were disturbing and sick, but I felt it was done just for the sake of them being described as shocking. I DNFed after one third of the book. A below average ‘thriller’ that offers nothing original, just providing a string of cliches and stilted dialogue scenes as a plot. To be avoided – a total failure. 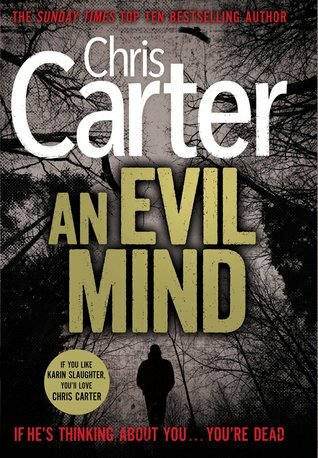 This entry was posted in a total failure, book review, crime, grimdark, horror, psychological, rating and tagged a total failure, an evil mind, chris carter, flat characters, robert hunter, series alert, too many borrowed scenes. Bookmark the permalink. Super lame. It sounded so good too! A failure cat doesn’t exist ;p.